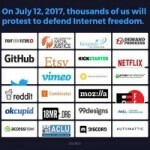 On Wednesday, nearly 70,000 websites and organizations are planning to take part in a massive online protest to save net neutrality. Participating websites will reportedly display messages on their homepages and encourage users to take action to save the internet as we know it. On Wednesday, nearly 70,000 websites and organizations are planning to take part in a massive online protest to save net neutrality. Participating websites will reportedly display messages on their homepages and encourage users to take action to save the internet as we know it. Supporters of the day of action include internet giants such as Twitter, Amazon, Facebook, Google and Reddit. Earlier this year, Federal Communications Commission Chairman Ajit Pai outlined his plans to dismantle net neutrality rules despite polling that shows most Americans support a free and open internet. As the Trump administration weighs the proposed AT&T-Time Warner merger, former FCC Commissioner Michael Copps talks about the risks of greater media consultation. He’s currently special adviser on media and democracy reform at Common Cause. In Venezuela, nearly 90 people have died and more than 1,500 have been injured since April, when opposition groups began organizing a new round of street demonstrations. Venezuelan President Nicolás Maduro has accused his opponents of waging an “armed insurrection” and economic sabotage backed by the United States. Opposition groups have accused Maduro of turning into a dictator.